Most barbecue restaurants serve pork ribs. Beef ribs are a little less popular which makes them a cheaper rib to purchase at the store. They are also typically larger than pork rib racks. Low and slow is a key to smoking beef ribs if you want them to turn out tender enough to pull right off the bone. Though this is against conventional wisdom, you do not want your rib meat to actually fall off the bone. This is a misconception because it is a marketing term commonly used among people who don't understand the perfect smoked beef ribs. If your ribs are falling off the bone, they are probably cooked with too much water and have become mushy. This is what typically happens when someone boils ribs for too long. This recipe will teach you the proper way to smoke your ribs so they turn out perfect every time. 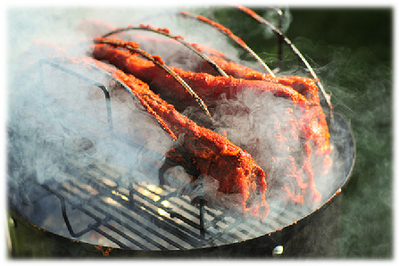 Light your smoker and soak your wood chips in water prior to starting to prep your beef ribs. To prep your ribs for smoking, use a butter knife between the white membrane and the bone on the under side of the ribs. You will need to strip this membrane off the ribs so your seasoning can penetrate the meat while cooking. Mix the seasoning ingredients together and fully coat each side with the beef rib seasoning. Don't worry about putting too much seasoning on the ribs. If your smoker is heated to about 225 degrees Fahrenheit then you are ready to put your wood chips on the coals or smoker box of your smoker and the beef ribs on the grate. Make sure to lay the bone side of the ribs where you tore off the white membrane down on the grate. This will ensure that all of the fat will melt downward during the smoking process and help to moisten and tenderize the beef rib meat. After a couple hours, check your beef ribs about every hour to see if there is about a half inch of bone sticking out at the end of the ribs. This is a good indicator of the ribs being done because the beef rib bones will shrink back during the smoking process. Some people enjoy dry ribs, so this step is optional if you want to caramelize barbecue sauce directly on the ribs before you serve them. To caramelize the barbecue sauce, mop on the sauce directly on the finished rib and slap it on a hot grill. You want to heat the sauce over a hot grill to cook it quickly to form a caramelized crust. Repeat this step on the other side of your beef ribs and then taken them off the grill. After you remove the ribs from the grill, wrap each rib in aluminum foil. Allow to rest at room temperature for a half hour before you cut into them. This step will greatly improve the texture and tenderness of the beef ribs. The average cooking time for beef ribs is about 4 to 6 hours on average but will vary depending on the size of the beef ribs. There are many other factors that will impact the timing like the temperature, the type of smoker you are using, and how many times you open the smoker lid. Beef ribs are easy to know when they are done because the rib bones will be a half inch sticking out and exposed from the meat. This is because the meat will shrink down during the smoking process. See our meat doneness chart for a full list of different meat internal temperatures.